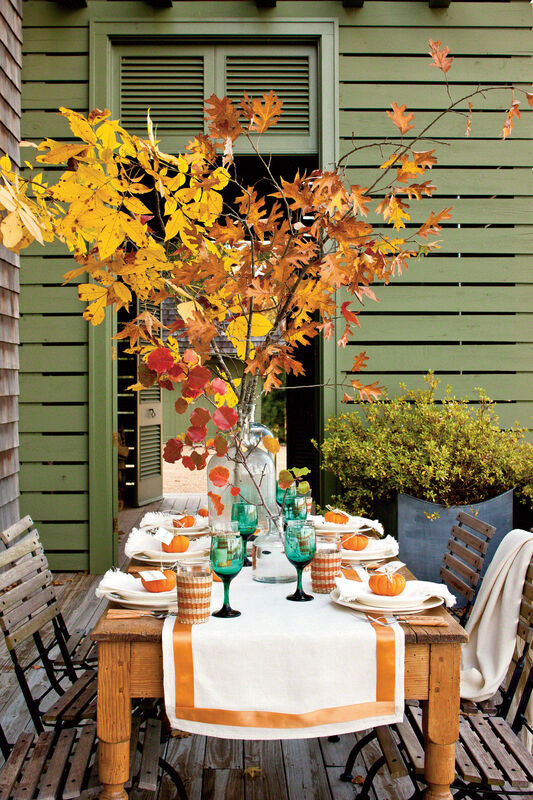 Durable furniture, pretty fabrics, and even lamps make this a great spot to spend time outdoors. Getting your family away from the TV and into the great outdoors can sometimes be a daunting challenge―unless you have a prime place for gathering. That’s what Gaye and Frank George discovered when they turned their back porch in Valdosta, Georgia, into one cool spot. “Frank and I―and especially our kids―are always having friends over to our house, and this porch invariably becomes the main go-to space,” says Gaye. The space is outfitted with practically everything that you would find indoors―tables, comfortable chairs, pillows, lamps, rugs, a clock, and even a pillar candle or two. A couple of inexpensive oil paintings hanging on the back wall complete the look. A true crowd pleaser, the Georges’ outdoor hangout accommodates both their living and entertaining needs. In keeping with the home’s brick and columned exterior, residential designer and builder Todd Wilson, also of Valdosta, encircled the porch on two sides with handsome box columns. 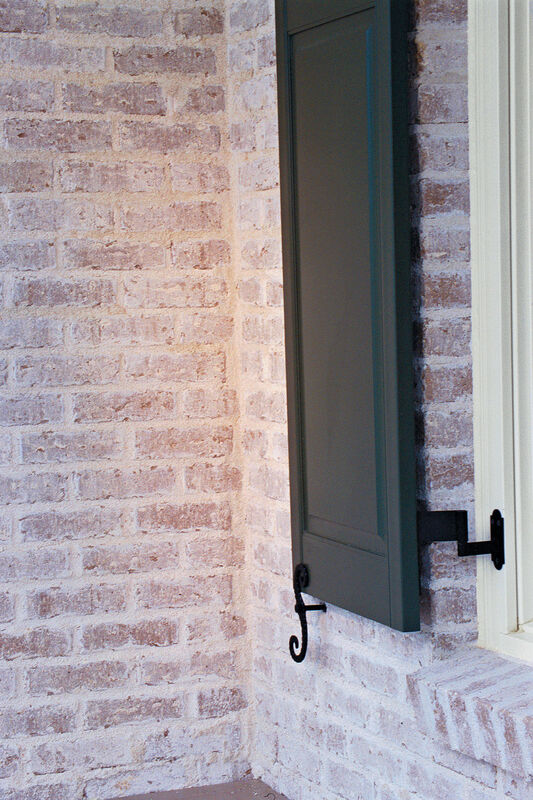 He also covered the inner walls with lap siding, not only to weatherproof the space, but also to give it texture. Anticipating the constant flow of this ever-active family, Todd installed handsome brick flooring for its permanence and good looks. Counterbalancing these hard surfaces, comfy cushions and pillows fashioned from patterned and solid fabrics fluff up the seating. Large ferns and hanging baskets of bougainvillea soften the space and serve as a constant reminder that you’re not inside―just in case you forget. 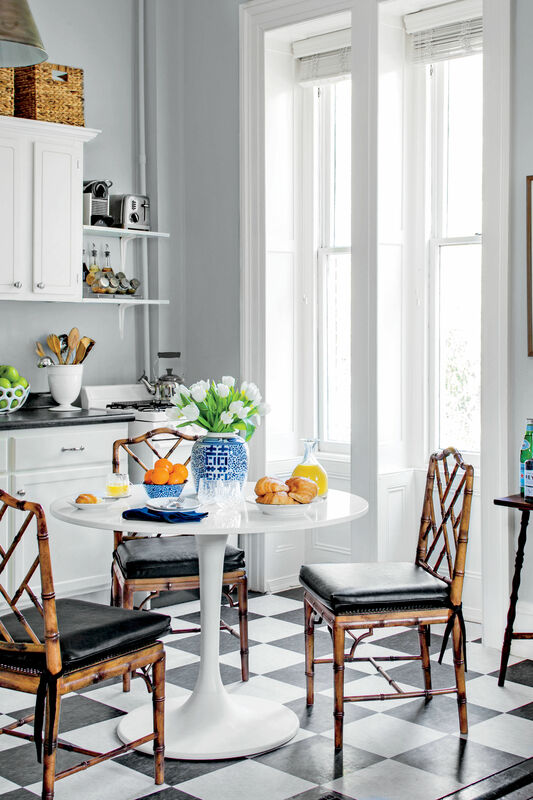 Shades of Light has a lamp with a beautiful blue base that is similar to the antique lamp in this space. Available at Shades of Light, www.shadesoflight.com. A sisal rug is perfect for outside. Available at JC Penney, www.jcpenney.com. The clock keeps on ticking, rain or shine. Available at Target, www.target.com. Punch up an outdoor space with polka dots! Noveltex makes a fabric called Spring Dot in Turquoise on Oyster. Found at Forsythe Fabrics, Atlanta; (404) 351-6050. Sit by the soft glow of candlelight with a decorative lantern candle stand. Bobbie Harris of Artistic Flowers in Moultrie, Georgia, can get you one; (229) 890-1883. Relax on the weather-resistant furniture from Meadowcraft; www.meadowcraft.com. 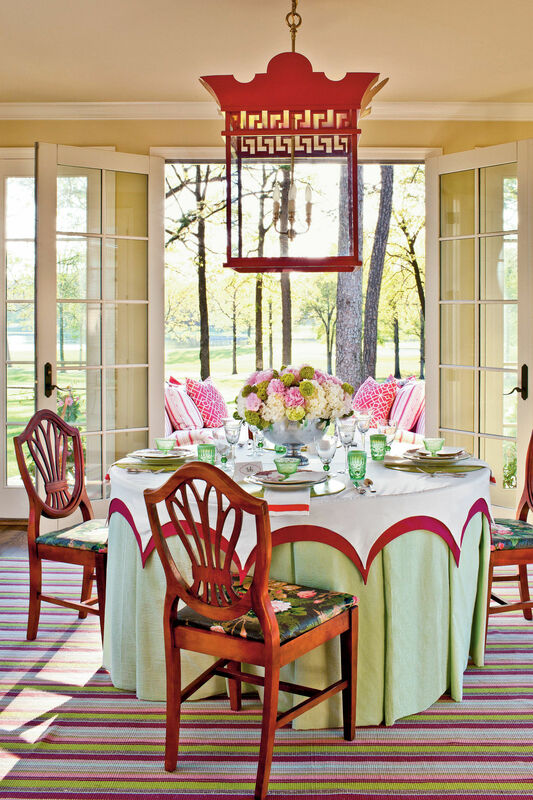 "Hang Out on the Porch" is from the May 2008 issue of Southern Living.